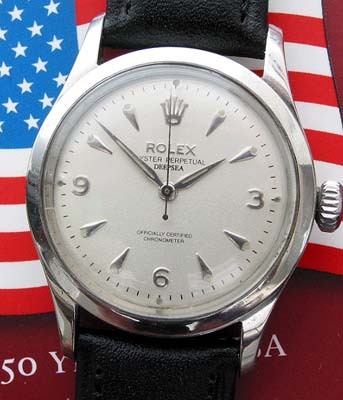 This model of vintage Rolex, reference 6332, is often discussed as it is the only model of Oyster cased watch that Rolex made with flat sides as opposed the the rolled or curved sides one normally sees. The restored dial features the popular Explorer style 3, 6, 9 pattern of steel Arabic numerals set against the Oyster white colored dial. 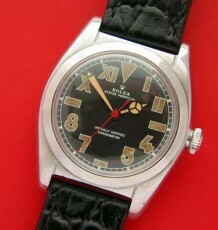 Another key vintage feature of the watch are the original lance shaped steel Rolex hands that were discontinued in the 1950’s. 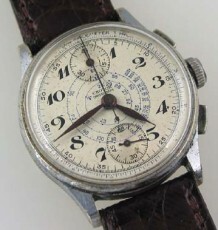 This watch dates to 1954. 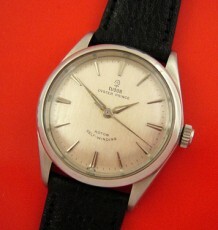 The stainless steel Oyster case has been lightly detailed and there are slight dents on the edge of teh case back that are not noticeable when the watch is being worn as that surface lays face down on your wrist. The Rolex semi bubbleback automatic caliber 645 movement was just serviced by my Rolex trained watchmaker and is running like new and keeping excellent time. 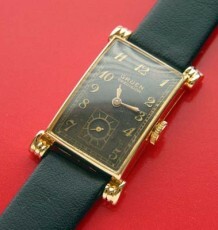 The watch measures 33.5mm wide by 42mm long and is supplied on a choice of black or brown leather straps.